Muhammadiyah, as a movement, has a close history to Indonesians. Established prior to Proclamationof Indonesian Independence, it is not surprising if Muhammadiyah’s members are across Indonesia. However, according to a professor of culture and anthropology Kim Hyung-Jun of Kangwoon National University, the Republic of Korea, a fact shows that, at the beginning of its establishment, Muhammadiyah broadcasting was not undertaken by its members. 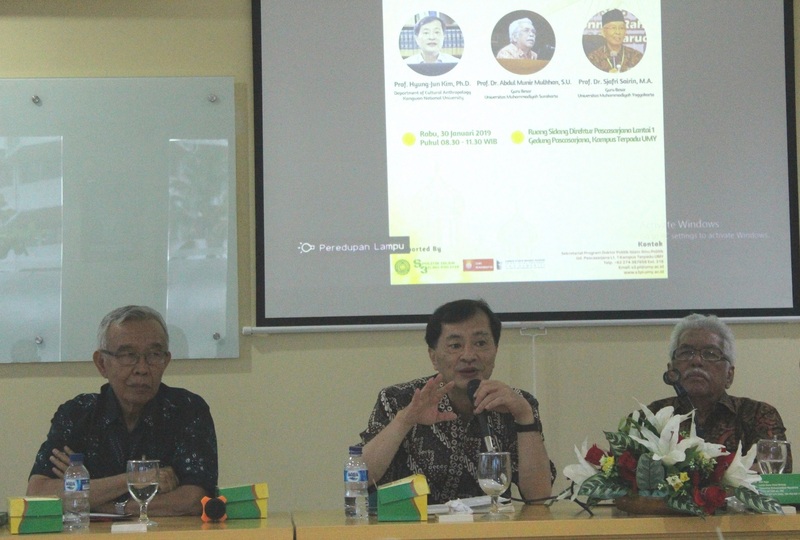 At a monthly discussion of Muhammadiyah conducted by Graduate School of Universitas Muhammadiyah Yogyakarta on Wednesday (30/1) at Building of Kasman Singodimedjo of UMY, Kim Hyung-Jun presented his research done in Gamping, Sleman in the 1990s. His research findings revealed community shifts were mostly affected by external factors. “I found changes in community, particularly how they defined and responded to Islam. For instance, the alteration refers to a transition that they only admitted Islam, called Abangan, and they implemented Islamic teachings due to regular Islamic preaching in the village,” he declared. Kim discovered an appealing phenomenon that the preachers were not Muhammadiyah members. “Indeed, they did not graduated from an Islamic boarding school, but the circumstance emboldened them to learn Islam deeper and perform dakwah. They became a role of preachers having high education and exemplified modern Islam,” sated Kim. “Nevertheless, unfortunately, Muhammadiyah played lack of roles although a Muhammadiyah branch in the village was founded about 1930. Preaching or religious activities were rarely held in the village, and the community transition was not accommodated well by the Muhammadiyah branch organizers,” emphasized Kim. Meanwhile, the other speaker at the discussion Prof. Dr. Sjafri Sairin, M.A. considered that Kim’s research proved creative minority. “Kim’s research showed that a creative minority can bring a change in an environment. The preachers encouraged Abangan people to entirely apply Islamic teaching. The condition became the first vigor of Muhammadiyah to take a role as a reformist,” maintained Sjafri, a professor at Doctoral Program of Islamic Politics of UMY. Sjafri added that lack of Muhammadiyah roles at the village became a lesson for a Muhammadiayh dakwah method today. “As a movement, Muhammadiyah should be able to afford the community and be a home literally and figuratively,” he stressed.